I was pleased to be invited by the Thorpeness Hotel and Country Club, where I photographed a wedding in November, to submit a few images from the day that they might be able to use as part of a forthcoming article featuring the venue in the January 2014 edition of Suffolk Norfolk Life. The picture that was used- see below – is of an antique suitcase used to display congratulations cards and similar at the reception with the guests in the background enjoying their food and drink. The other two pictures aren’t mine though…the November weather turned out rather dull and grey and not conducive to spending too long out of doors! The Country Club was a lovely venue, close to the cliff top in Thorpeness, and I was glad to be a part of the bride and groom’s day. 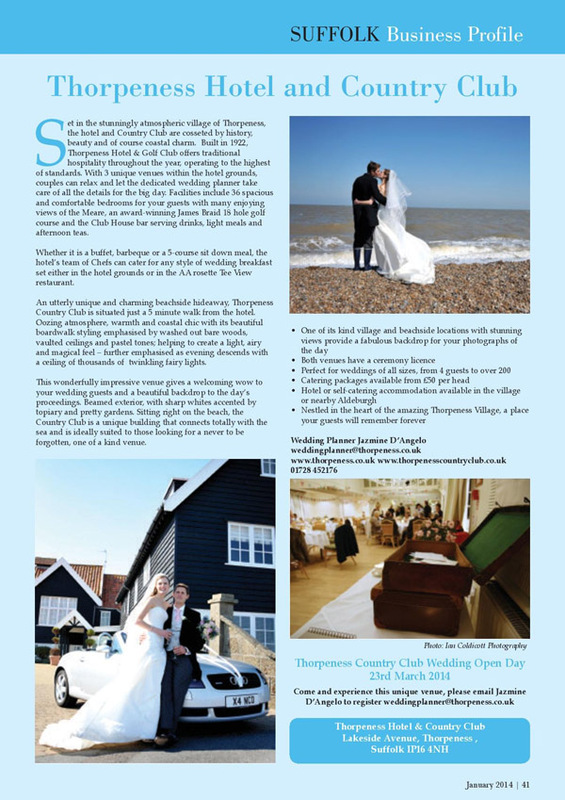 This entry was tagged Norfolk, photography, Suffolk, Suffolk Norfolk Life, Thorpeness, Thorpeness Country Club, wedding. Bookmark the permalink.